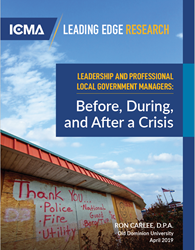 Today, ICMA (the International City/County Management Association) published Leadership and Professional Local Government Managers: Before, During, and After a Crisis, illustrating the profound long-term importance of competent crisis management. The report provides a spectrum of in-depth research on nearly every kind of crisis local governments might face and offers straightforward ways to improve operations at every stage. The report was written by Dr. Ron Carlee, visiting assistant professor of public service at Old Dominion University who has served as an interagency incident commander for many high-profile crises, including the 9/11 attack on the Pentagon, the 2002 Washington, D.C.-area sniper attacks, and Arlington County’s response to Hurricane Isabel. Drawing on these cases, a wealth of after-action incident reports, and his own expertise, Carlee presents a list of lessons learned addressing every stage of crisis operations including: specific questions to ask while creating a crisis plan; best practices for supporting both self and employees during a disaster; how to work most effectively with the media, volunteers, and federal and state agencies during recovery; and the benefits of consulting other managers with expertise. This final point is emphasized across the report as well as by its case-study format and Carlee’s own background as a county manager. The report concludes with a list of additional resources to allow immediate next steps. The full report as well as other crisis and disaster recovery resources can be found at ICMA.org. ICMA, the International City/County Management Association, advances professional local government management worldwide through leadership, management, innovation, and ethics. ICMA provides member support; publications; data and information; peer and results-oriented assistance; and training and professional development to more than 12,000 city, town, and county experts and other individuals and organizations throughout the world. The management decisions made by ICMA's members affect millions of individuals living in thousands of communities, from small villages and towns to large metropolitan areas. ICMA gathers more data on local government than any organization except the federal government, spanning a broad spectrum from economic development to local government innovation. Ron Carlee is the current director of the Center for Regional Excellence at Old Dominion University’s Strome College of Business. His emergency management experience includes managing Arlington County’s response to the 2001 terrorist attack on the Pentagon during his first year as city manager, drawing significant praise from third-party evaluators. Carlee has since been considered as one of the foremost leaders in crisis management, having assisted in major recovery efforts on the ground following several major disasters. He has written and presented extensively on local government in the areas of ethics, social and racial equity, and emergency management, and his graduate teaching focuses on leadership, local government management, ethics, racial equity, and budgeting/finance. He was Chief Operating Officer of ICMA from 2010 to 2013.